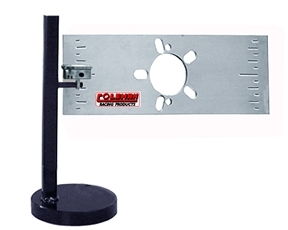 This bump steer gauge was designed with the budget racer in mind. Its simple design uses one indicator instead of two, which makes adjusting bump steer simple and easy. The one piece indicator base allows you to use a standard floor jack to raise and lower the suspension. Simply move the indicator and base from front of spindle to rear of spindle raise and lower the suspension and write the movements down to calculate bump steer travel. The use of one indicator makes keeping track of bump movements easier than gauges with two indicators. Fits 5 x 5 and Wide-5 bolt patterns.